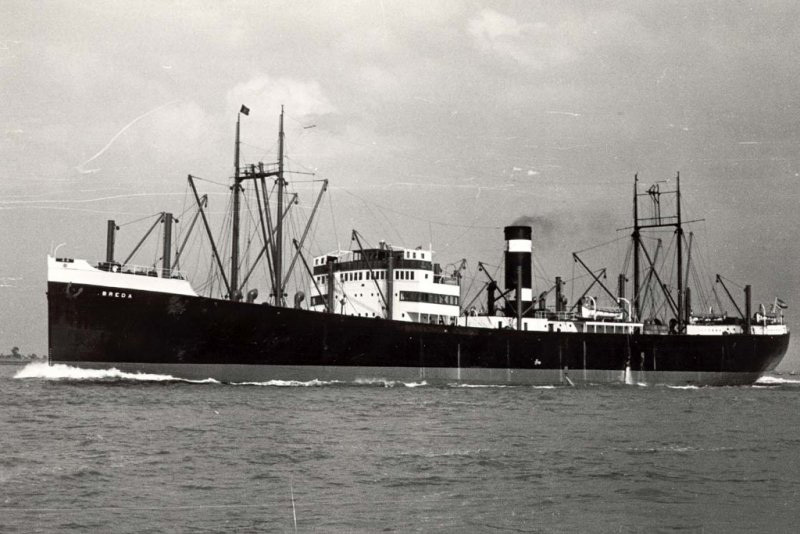 On Christmas Eve 1940, the Dutch vessel Breda was bombed during a German air raid on Oban roads, while in convoy from London to Mombasa and Bombay. The aircraft were Heinkel’s He 111 bombers based at Stavanger, Norway. Although the bomb was not a direct hit, she suffered damage in the form of a fractured cooling water inlet pipe, and taking in water, made her way, under her own power, to the east shore of Ardmucknish Bay. There, Captain Johannis Fooy beached her on a shelf which extends 600 yards out to sea, where the depth is still only 6 metres. Beyond that, the bottom slopes quickly to over 30 metres. She remained on this shelf long enough for some of her cargo to be removed, before a storm swept her into deeper water and she came to rest with her bows in 24 metres and her stern in 30 metres. Her goalpost foremasts were visible above the surface at low tide until 1961 when the Navy removed them along with the bridge, funnel, and forepeak to give a swept clearance of 28ft. They are now lying in the mud off the port side of the ship. The gun mounted on the platform structure at the stern was presumably also removed at that time. Registered in Rotterdam and belonging to the Royal Netherlands Steamship Co., the Breda was built in Schiedam, Holland in 1921. Apart from being laid up in Amsterdam in 1923 and 1924, the normal route for the ship was between Europe and South America. 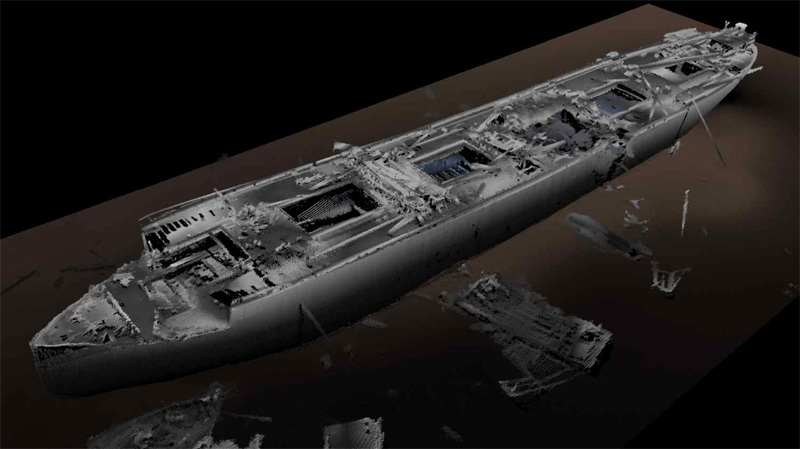 At 6941 tons gross, she was 418ft.6” long, 58ft wide and had a moulded depth of 37ft. From the heel to the top of the foremast measured 117ft.6”. She had 3 decks, a cruiser stern and a flat bottom. The bridge lay between the second and third of the Breda’s five holds, and contained the radio and navigation rooms, officer’s accommodation and cabins for 16 passengers. Aft of hold 3 lay the engine room whose four boilers were originally coal fired, but were converted to oil in 1938. These produced steam for two turbines with double reduction gearing to a single screw. Her service speed was 11.8 knots, and fuel consumption ran at 36 tons of oil per day. The stern housed accommodation for the 37 crew. On the main deck is the steering gear, with the emergency steering position on the deck above. This had originally been open to the elements, but a platform was erected above this position to carry the gun which was fitted during the war. This structure is home to a forest of sea anemones and is easily the most picturesque part of the wreck. In 1966 the wreck was rediscovered by Edinburgh BSAC divers, and despite the loss of her bridge, derricks and funnel, still looked undamaged and ready to sail again, if she could be raised to the surface. Blasting by Oban Divers removed the bronze propeller in 1968 and further blasting has since removed most of the remaining superstructure, improving access to the lower decks and engine room. The copper degaussing cable, for protection against magnetic mines, was also recovered by Oban Divers, and the insulation burned off on Eilean Mor. At the time of her sinking, the Breda was carrying a very mixed cargo, consisting of 3000 tons of cement, (now set solid), 175 tons of tobacco and cigarettes, (very soggy and hard to smoke), 3 Hawker and 30 de Havilland Tiger Moth biplanes. Aircraft engines, propellers, windscreens, instruments and various other parts have been recovered. The aircraft, which are now hard to recognise, are stored in holds one, two and three. Sandals with leather uppers and rubber soles, medical supplies, including kaoline in what may best be described as square-shaped Mk 1 waisted Coca Cola bottles, batteries, wide strips of leather, tyres, telephone pole insulators, lengths of solder, black boot polish and innumerable other items have been recovered from hold No1. On the deck alongside hold 2 lies an upside down 4×4 vehicle with the tyres still fully-inflated. Another similar vehicle has fallen from the deck to the bottom of hold 2, which also contains aircraft and beer bottles. Hold 3 contains aircraft, tin lids, tyres, barrels containing stoneware bottles of Stephens blue ink, (how many divers can claim to have dived in in? ), dental supplies, including what appears to be drinks coasters, but which are actually material for taking dental impressions, and the pink material for making gums of false teeth. Regretfully, all efforts have so far failed to find the material for making gold fillings. Hold 4 contains truck spares, gas masks, spectacle lenses, fire hoses, the spare propeller, (cast iron), trolley compressors with brass, double-acting cylinders (for inflating tyres), brass fire extinguishers, aircraft batteries, and between holds 4 and 5, the 3000 tons of cement. Square porthole glasses of two different diameters, individually separated by pages of a 1940 Dutch newspaper were also recovered as recently as 1989. The newspaper was still legible, and included the pages giving the BBC radio programmes. Brass oil lamps with gimballed brackets cast in the shape of dolphins were also recovered at the same time. Apart from more of the cement, hold 5 contains bicycles, electrical equipment including switches, fuses and GEC ceiling fans, along with bales of hay for feeding the 10 horses, reputedly belonging to the Aga Khan, which was also part of the cargo. When the Breda was beached, the horses were either released to swim ashore, or the horse boxes drifted off with the horses still inside. One of these boxes came ashore near Ledalo Spit, with a horse still inside and a very distraught dog standing on top of the box. They were rescued by Mrs Mary Mac Niven, wife of the caretaker at Dunstaffnage Castle. Not all of the horses survived, but at least one was kept in the old smiddy adjacent to the cemetery at the southern edge of the village of Benderloch. The last survivor of the horses died in the Oban area in 1961. The sunken ship remains at a depth of 26 metres (85ft) at position 56°28’32”N5°25’04”W and has long been a popular dive site, with some of her remaining cargo still being accessible. In 1992 a diver found a wooden crate, we believe in hold No 1. Whilst the timber crate was rotting away, the diver originally thought the box contained Gold, but in fact was Brass Button Sticks manufactured by J Banks. The Brass Button Sticks were used to protect the fabric of a uniform or coat whilst cleaning buttons. The stick would be placed behind a button, the polishing cloth could make contact with the button and the stick would prevent the fabric from being damaged. The sticks were stamped with J Banks & Co Ltd Willenhall and the diver traced them back to us and returned a handful that we still have today on display.